SACRAMENTO, Calif. (AP) — The family of a 22-year-old unarmed Black man killed by police last year filed a wrongful death lawsuit Monday seeking more than $20 million from the city of Sacramento and the two officers who opened fire. 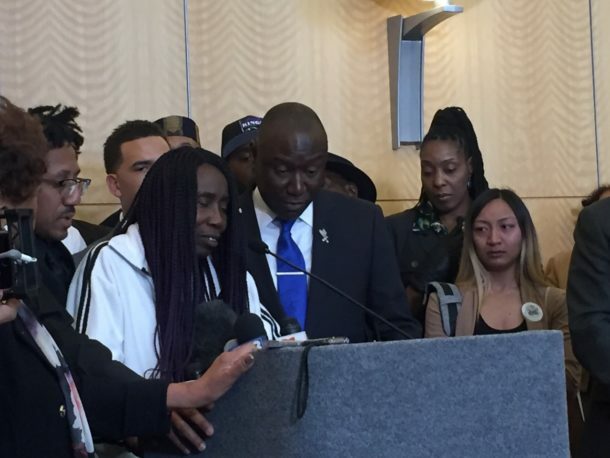 The federal lawsuit filed on behalf of Stephon Clark’s two sons, his parents and his grandparents contends that officers used excessive force and that he was a victim of racial profiling. The shooting set off weeks of protests that disrupted traffic in the state capital as well as professional basketball games in a downtown arena. The suit names Terrance Mercadal and Jared Robinet as the Sacramento officers who said they thought Clark had a gun while running from police during a vandalism investigation. Investigators found only a cellphone after Clark was shot in the backyard of his grandparents’ home on March 18, 2018. The suit says they failed to identify themselves as police or warn that that deadly force would be used. It alleges their use of deadly force was excessive and unreasonable because he wasn’t armed and there was no imminent threat. It also alleges that they delayed medical care after the shooting. It alleges the city failed to properly train its officers. Sacramento police referred requests for comment to City Attorney Susana Alcala Wood, who declined comment because of the pending lawsuit. Sacramento County’s district attorney has yet to decide if the two officers acted illegally by shooting Clark. The office received the Sacramento Police Department’s report in October, but said Monday that it received additional investigative reports and related materials from the state attorney general’s investigators two weeks ago that will delay a decision. Attorney General Xavier Becerra agreed in March to provide oversight of the investigation and review the police department’s policies and use-of-force training. He plans to announce his recommendations Tuesday on the department’s policies and reform efforts.